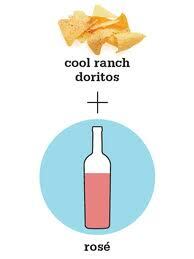 Junk Food And Wine…A Pairing Made In Heaven! Releasing pretenses is what the crowd did. Before beginning, Anthony instructed the audience to always take three separate sips of a wine before making a judgment of it. The first sip will always taste off (due to whatever residual flavors are in your mouth). The second sip will begin to give you a better idea of what’s in store. By the third sip, your palate is cleansed and ready to taste the full expression of the wine. He recommends then tasting the food to see how the fat and salt of the food affects the flavor of the wine.